A crooked knife is a handy bushcraft tool. A crooked knife used to carve a paddle. A crooked knife is one that's made with the handle set at an oblique angle to the blade. It's prehistoric predecessor was the incisor tooth of a beaver mounted in a handle made of wood or bone. One of the uses was to hollow out the centres of logs that had first been burned to destroy the tough fibrous interior. Europeans improved on the original knife by making the blade from whatever metal was at hand - old axes and knives, for example. But the steel in old trap springs was best. The blade can be long or short, straight or curved, made from recycled hardened steel or from steel specifically forged for the purpose. 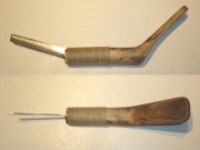 If the blade is straight it is used for whittling and shaping wood, making splints for baskets or incising patterns. A curved blade is used to hollow out bowls, masks and ladles. A crooked knife is such a handy tool that one old timer was quoted as saying, "What I can't do with it, I can't do at all! It's the best tool that I ever used in my life. Theres lots of people who don't know how to use it. I've seen people use them upside down. You can't use it like that. If I was goin' to make a shavin' with a pocket knife. I'd cut away from me. If I was makin' a shavin' with a crooked knife. I'd cut towards me. That's how 'tis done." I suppose it would be nice to have a handy dandy forge available if you were going to go into the crooked knife making business...but forges were few and far between in the bush north of Lake Superior where I lived, so these are instructions for people who just want to "make do". What you really need is a hot fire. A cook stove can get hot enough...but a clay or handmade stone oven can work, too. It's nice to be able to find wood that burns very hot...but use what's at hand. Birch and balsam will work. Assuming that you've managed to find an old leg trap, dismantle it and throw it in the fire until its red hot to take the temper out. When you remove the metal from the fire, you'll find that you can cut it into a respectable looking blade shape with a file. When you've got the shape right, heat it up again. You may have to experiment with the length of time it needs to be in the fire because of the variations in the type of wood used and the 'stove' you have available. Once it gets red hot again, take it out of the fire and dip it in a weak salt pickling solution. Then run a file over it. If you can't dig into the metal it's too hard. If it digs in too much, it's too soft. If it's too hard just try returning the blade to the fire. If it's too soft heat it again but put it back in the pickle afterwards. Finally file the blade. Like a plane or a drawblade, a crooked knife blade is only filed on one side. Crooked knives are made either right or left handed. If you have one of each available and you're making something like snowshoes or a canoe, you can always cut with the grain on any curved material. Basket makers used blades with special cross-section patterns - strong wedges - that were used for splitting wood strips, or flatter for smoothing the strips. Some blades are made with distinctly curved hook-like ends so that they can be used to hollow bowls, spoons, and boxes more effectively. 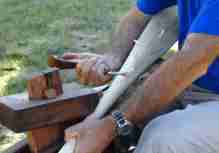 The idea is to make your crooked knife to suit the work at hand. Back to building the canoe.